Chinese jasmine plant features long, wiry vines that are densely covered with glossy, green leaves and fragrant star-shaped flowers. Cool autumn air and plenty of light will bring a profusion of blooms in winter. Because you're growing jasmine indoors, this beautiful evergreen needs some help from you. Give it plenty of sunshine and warmth in the summer months to help it grow. Then provide 6 weeks of cool temperatures in fall to set buds. Move your jasmine plant outdoors in the fall when the weather is cool, keeping it in partial shade. If you can't put it outdoors, keep it in a cool sunroom, brightly lit porch, or other cool room for this cool treatment. Clusters of dark-pink, tubular flower buds arise from the leaf axils in late fall to early winter. The buds stay small until around February, when they will open into 5-petaled, white star-like flowers that are strongly scented, especially at night. Pinch stem tips during the growing season to encourage branching. After the flowers fade, prune it back harshly. Plants that aren't pruned back will eventually have bare lower stems as they shed old leaves. Pruning tip: Prune back hard in spring or early summer to control its growth and to prevent it from becoming leggy. Take care to only remove the stems that have already flowered. Propagate stem tip cuttings, if you want, for more plants. Repot in spring only when the roots have filled the pot. Jasmine plant blooms best when slightly pot-bound, so use a smallish container or you may see a lot of leaves and few flowers. Don't worry about pruning and repotting jasmine at the same time. It's pretty robust -- you won't hurt it at all. Jasmine vines need support. You can easily train it around a hoop or over a small trellis inserted in the pot. You can tie it to the support with florist wire, if you need to. However, this vigorous climber doesn't need much training to twine around any type of support. Jasmine is a member of the olive family (Oleaceae), and includes about 200 species. 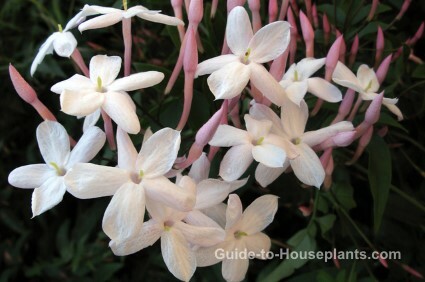 Jasminum polyanthum is the easiest to grow indoors and has long been a popular house plant. You may find Chinese Jasmine plant for sale by other common names: Winter-Blooming Jasmine, Pink Jasmine or Star Jasmine. Height: Up to 10 ft (3 m) if not pruned back. Light: Jasmine needs plenty of light to bloom. Give it bright light with some direct sun. Water: Keep soil evenly moist while plant is growing and flowering. After flowering, allow the the soil to dry slightly between waterings. Soggy soil will cause leaves to turn yellow and fall off. 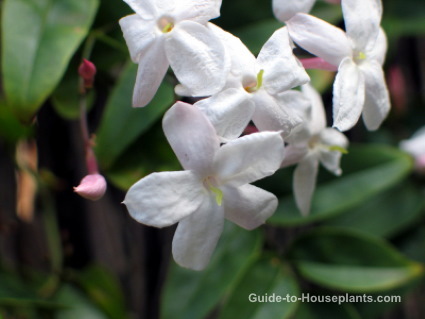 Plant jasmine in a pot with a drainage hole and water enough to keep the soil lightly moist. Humidity: Try to maintain 40-50% relative humidity around jasmine. Central heating and A/C can cause the humidity to drop drastically indoors. Discover easy ways to increase humidity for your houseplants. Temperature: Give jasmine cool temperatures (40-60°F/4-16°C) for 6 weeks in fall to set buds. The rest of the year, average to warm temperatures (60-75°F/16-24°C). Fertilizer: Feed every 2 weeks with a high-phosphorus liquid fertilizer diluted by half. Don't fertilize in spring after the flowers fade, while the plant is resting. Propagation: Take 4 in (10 cm) stem tip cuttings in early summer and root them in moist soil.